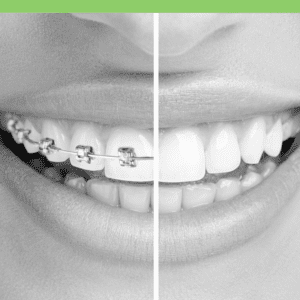 Orthodontics is a specialty of dentistry that treats malocclusions, commonly known as unaligned or “crooked” teeth. There are a few causes for malocclusions. These include uneven development of the jaw, irregular tooth growth, or trauma. Orthodontists sometimes treat malocclusions to fix biting issues, although most of the time, orthodontics is performed for aesthetic reasons. Because orthodontics is typically performed in teenagers, many adults think they can’t benefit from it. However, adults can still get their teeth straightened. Another misconception about orthodontics is that they are extremely uncomfortable or visible. While this was true in the past, with the developments of modern dentistry, it is not the case anymore. The main way to treat malocclusions is with the use of dental devices that can be fixed, semi-fixed, or removable. A dentist will have to evaluate your mouth and help you decide what the best device is for your specific needs. The most common devices are braces and retainers, although their size, material, and form can vary greatly. If you are interested in orthodontics in Costa Rica, fill out the “Find a Dentist” form on this page. One of our patient advocates will reply to your needs.